Licorice root comes from the plant Glycyrrhiza glabra, which belongs to the pea plant family. Licorice root has been used in traditional Chinese medicine as an additive to most herbal remedies. The herb contains several nutrients and active constituents that give licorice root its potential health benefits. Before you begin taking licorice root for any medicinal purpose, consult your doctor to discuss the possible risks, side effects and drug interactions. Licorice root contains amino acids, the isoflavone formononetin, a polysaccharide sterol called B-sitosterol and several amines, including choline, asparagines and betaine, according to the Memorial Sloan-Kettering Cancer Center. Licorice root also contains flavonoids like glabridin, liquiritin and chalcones, as well as coumarins like glycyrol. The flavonoids and a substance called glycyrrhizin are considered the main active nutrients in licorice root, notes the University of Michigan Health System. Glycyrrhizin is a type of triterpenoid saponin. Because glycyrrhizin can cause serious health dangers, especially when taken in large amounts, manufacturers of licorice root remedies extract this substance from the herb, according to the University of Pittsburgh Medical Center. There are two types of licorice root – one containing glycyrrhizin and one with the glycyrrhizin removed, called deglycyrrhizinated licorice or “DGL.” Although the glycyrrhizin could provide anti-inflammatory effects in the body and help to break down cortisol, the substance also mimics the hormone aldosterone, which increases blood pressure, causes potassium loss and stimulates fluid retention. Licorice root in the whole-herb form that contains glycyrrhizin could have the potential to help treat asthma, coughs and chronic fatigue syndrome when taken orally or treat psoriasis, herpes and eczema when used topically, according to the University of Pittsburgh Medical Center. The DGL form could help treat stomach ulcers, heartburn, indigestion and mouth sores. The whole herb could help in treating chronic fatigue syndrome, hay fever, hepatitis, menopausal symptoms, Crohn’s disease, gastritis, infections, colic, shingles, ulcerative colitis and melasma, says the University of Michigan Health System. Other potential medicinal uses for licorice root include treating constipation, bronchitis, chest congestion and primary adrenocortical insufficiency, notes the Memorial Sloan-Kettering Cancer Center. But no widely accepted, conclusive medical research supports the use of licorice root in the DGL or the whole-herb form for any health purpose. The major dangers associated with licorice root relate to the whole-herb form that contains glycyrrhizin and not the DGL form, according to the Memorial Sloan-Kettering Cancer Center. Still, licorice root may pose dangers to people with kidney or liver disease, as well as pregnant and breastfeeding women. Whole licorice root can reduce testosterone levels in men, increase a pregnant woman’s risk for premature delivery and even stimulate the growth of breast cancer cells, says the University of Pittsburgh Medical Center. 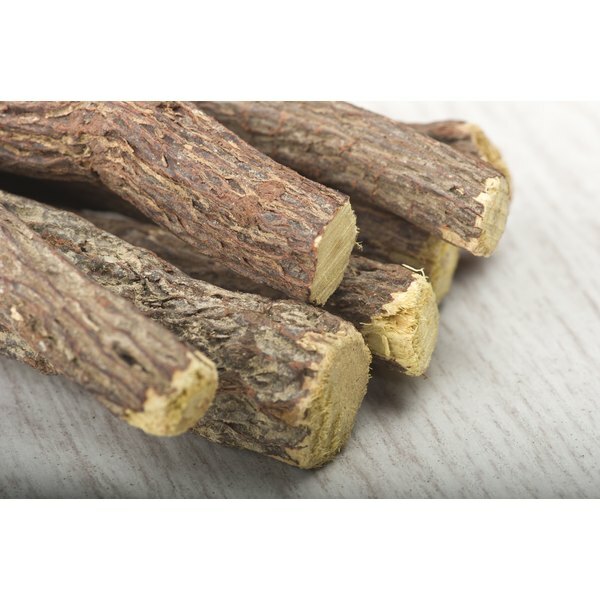 Licorice root could interact negatively with certain medications, including insulin, cardiac glycosides, diuretics, corticosteroids, sprionolactone or amiloride, hormone therapies, blood-thinners and MAO inhibitors. How Many Calories in a Teaspoon of Granulated Sugar?